You slaved away for 3 hours crafting the best email ever. The perfect blend of high-value content with a pitch a humor, a sprinkle of story and call to action no one could ignore…..
It’s not 98′ anymore. No one’s firing up AOL. Praying to hear those iconic words “YOU GOT MAIL”. The AOL voice must have laryngitis because the average adult gets over 147 emails A DAY! That’s a lot of people fighting for your subscriber’s eyeballs. Think about it. Doesn’t your heart skip-a-beat every Friday when you know your favorite blogger sends out an email that day? She could have the world’s crappiest subject line ever but you’re still fanatically searching your inbox for it. Just like podcasting, video-blogging or regular blogging getting on a set schedule for e-mailing your list is key. Instead of waiting until the last minute why not sit down and bang out all four emails at once (batching) then schedule them to go out. Those email subject lines are pretty hard to ignore. (Be honest, we both know you were thinking about how gross it’d be swimming in actual poop) Getting your readers to react before opening your email is a good thing. 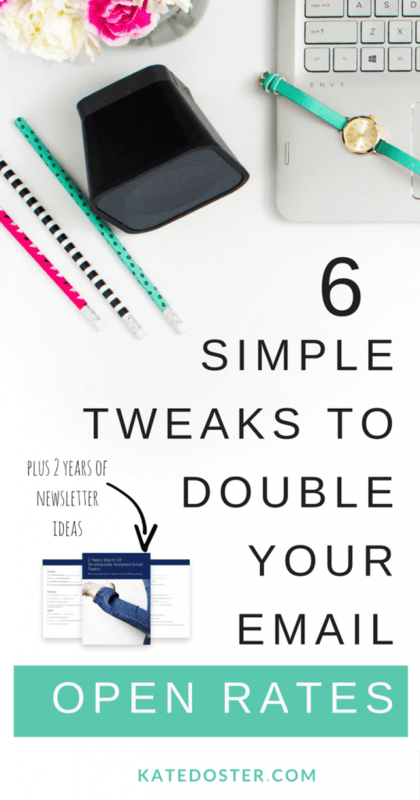 1.Have freebies and content upgrades that relate to only certain blog categories for examples: For all my post about blogging I include my 4 Day Launch Your Blog Mini-Course Freebie, for Webinars I have my Trello board webinar workflow, for email marketing I have my 2 years worth of email ideas. 2.Use the “Harry Potter” email. That’s when you ask people to pick the reason they joined your list or what their knowledge level is. (See the Email Marketing Fairy for a word-for-word script of the Harry Potter email). Of course, if you don’t have anyone to sort – you need to check out this blog post with 15 tiny things you can do to grow your list in an hour. According to the fine-folks over at Mailchimp the term “Freebie” gets more opens then FREE. Why? Probably because the word “FREE” sets off spam filters faster than a cheetah chugging Redbull. Adding brackets [ ] creates visual interest, instantly helping your email stand out from the crowd. Newsflash people love talking about themselves and feeling special. While some email marketing gurus tell you to use people’s first names in the subject line – Don’t. If a subscriber mistyped her name or used a fake name when signing up for your list seeing “Kste, I dare you to open this” or “Turd Ferguson, we miss you!” it’s an instant turn off – (like farting). This is my favorite copywriting hack for headlines and subject lines. By adding the word “this” instead of a noun you create an instant curiosity factor. People need to know. Write your subject line last! Write the content first. Don’t waste 30 minutes racking your brain for a catchy subject line than throwing in the digi-towel when nothing comes. Don’t do that to your list. They need to hear from you. They need your help. The thing that really propels open is YOUR NAME. Think about, do you even read the subject line of your favorite bloggers? Nope. You see Elna, Terra or Sarah email you, you open it – no questions asked. And building that kind of inbox fame is alot easier then you think. It starts with having a toe-curling welcome series. Which you can listen about right here → How to create a toe-curling welcome series. Don't Worry About What To Send Your Email List Until 2020! Awesome Chanele. Printables are sooo popular. Great tips! I’ve always heard people push email lists but I’ve never heard anyone address the fact that people don’t always open them, which is usually me so I’m glad you talked about it! Thanks for stopping by Laura! Yes everyone seems to talk about growing a list but no one ever seems to talk about what do with it well. What’s your blog theflourishingmomma all about? Awesome post. Getting peoples attention via email marketing is getting harder and harder. I’m going to test some of these of tips in my next campaign. These are great ideas for getting people to read and respond to emails. I now I always don’t open emails if they are not interesting to me!